How to repair HP printer? Repairing the HP printer involves troubleshooting issues that are encountered by the printer through systematic procedures. The How to repair HP printer procedure often depends upon the problem that stops the device from printing. Different issues have different solution methods, while the printer reset becomes a common solution to the majority of the issues. Check if the printer is stuck with any visible issues such as the paper jam. Remove the jam in any area if that is identified to be the cause for error. Check if the ink cartridges are damaged or leaking. If so replace them immediately. Check for any clog in the nozzles of the printhead. Clean them with a lint-free cloth and try printing again. Ensure that no foreign object is stuck in the path of the printhead. Check if the printhead moves freely without any obstruction. Reset the entire printing system and try printing again. Check the connection peripherals and replace or reconnect them accordingly. 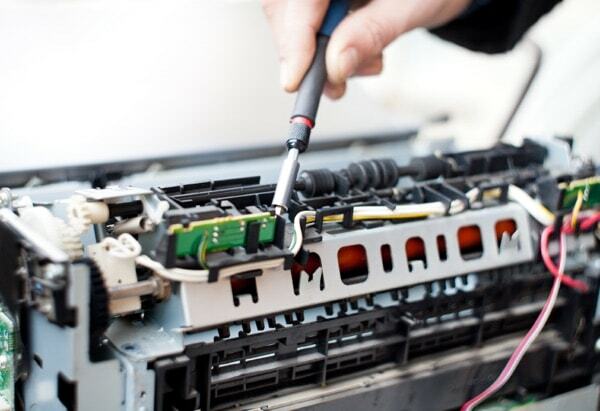 Take the HP printer to the nearest service center for any hardware issues. The issue that prevents your printer from functioning needs to be identified and resolved by this How to repair HP printer guide. Initially check the proper supply of power to the printer. The power cord is connected straight to a wall socket and not to any additional equipment such as a spike buster or surge protector. Check for any jam in various parts of the printer. Look for jam in the Input tray, Output tray or the printhead region. Use both hands and gently pull out the paper that is jammed in any part of the printer. Once the paper is removed completely, restart the printer and try printing again. Check for any leakage in the ink cartridges, if you find any damages or leakages in the ink cartridge, replace them immediately. Ensure that the cartridges used in the printer are of genuine quality obtained from authorized sellers. Ensure that the orange tape over the copper coils is removed. Open the cartridge door/scanner unit to get access to the printhead area. Check if the printhead movement is free. Ensure that no foreign object is stuck in the printhead area. If your printer has a removable type printhead, remove and re-insert it. Try printing again after completing this step. Remove the power cord from the rear panel of the printer while it is turned on. Wait for the residual power to drain and allow the printer to rest for 5 minutes. Now connect the power supply cable to a wall socket, turn on the power and connect it to the printer. This will reset the printer. Ensure that the connection from the printer and the personal device is established properly. Check for any damage on the USB cable if your connection is a wired connection. Restart the network router in case of a wireless network connection. Restart the printer and try printing again. Reach out to our customer support executives for further assistance on the printer issue. The printer that is down with a hardware problem and How to repair HP printer can be repaired only by taking it to the respective service center.